The most-hyped whiskey on the market runs up to $150 a shot. But you don’t have to spend that to find a great option. Kidding. Readers, of course, were appalled, equating the high price to gentrification and a sign of the apocalypse. We’ll get to where you can score good whiskey for under $10 soon enough. First, the reality is, get ready to dig deeper into your wallet. Whiskey is so popular now that distillers can’t keep up with demand because, well, if it’s a 15-year-old whiskey, then it will take 15 years to age before it’s bottled. You can’t make a 15-year-old bourbon overnight. In the meantime, there are fewer 15-year-old whiskeys at bars and more “non-age-statement” and other younger but more affordable alternatives on their shelves. But deals are out there. Look for specials and happy-hour discounts. The Booker’s Rye that connoisseurs are chasing for a Benjamin costs $37 during half-off Whiskey Wednesday at Lot No. 3 in Bellevue. The Bainbridge whiskey that costs up to $150 a shot went for $20 at Mulleady’s in Magnolia under its break-even bottle deal. Several bars offer that special because they realize there’s public outrage over whiskey prices so they designate a special bottle to sell at-cost as a goodwill gesture. Liberty on Capitol Hill, for instance, also sets aside a rare or collectible whiskey to sell at cost. Currently that’s the 1980 Old Fitzgerald for $25 a shot, two to three times cheaper than market rate. Just ask for its “sharing is caring” deal. 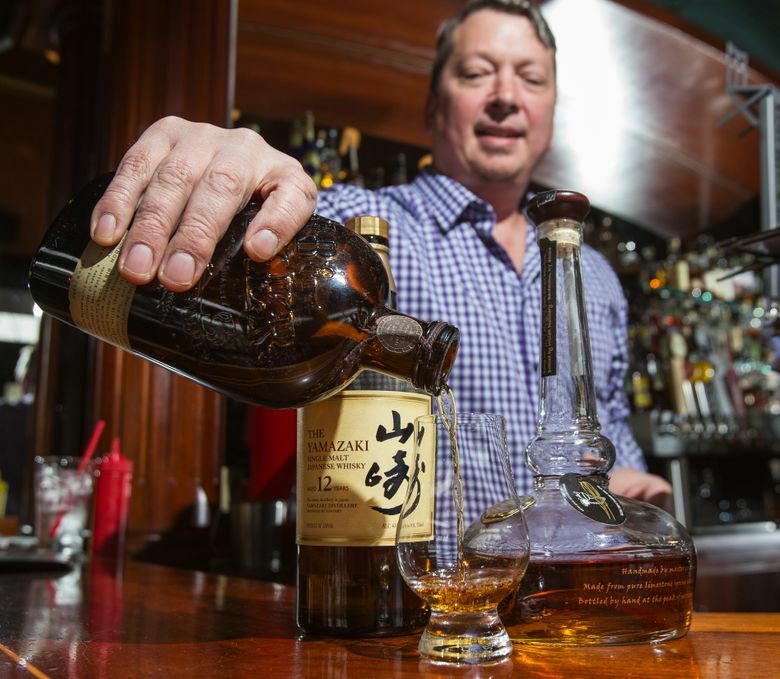 The best deal, and the best-kept secret really, is at Still Liquor, the subterranean bar on Capitol Hill where whiskeys are half-off Sunday nights. Many American whiskeys such as Maker’s Mark and Jack Daniels go for $4-$5. For a buck more you can upgrade to a Blanton’s bourbon ($6.50) or the Japanese whiskey Hakushu 12-year ($6). Even better are the deals in the $9 range such as the limited-release of Bourye ($9.50) from High West Distillery in Utah, arguably the most talked-about Northwest brand. Or hit DeLuxe Bar & Grill on Broadway East, where you don’t have to wait for Whiskey Wednesday. It’s priced the same every day, and reasonably so. This burger joint houses an extensive list of household and top-shelf brands. A shot here (1.25-ounce pour) is slightly less than the standard 1.5-ounce pour but still a better deal per ounce. A Weller 12-year, one of the hottest bourbons on the Hill, costs only $6. Japanese whiskey is the most popular and expensive category, but you can get the Yamazaki 12-year for $12 here. The cult Pappy 10-year goes for $13. Nearby, Clever Dunne’s Irish House sells most brown spirits for less than $10. The selection is modest but the pour is generous. But you only have until the end of January before this dive closes for good.